Got A New iPhone X, How to Erase the Old iPhone? Most people know that the new iPhone 8/iPhone 7S/iPhone 7S Plus is coming very soon and some people are already thinking of acquiring this awesome piece of device. While some people will be getting this device as their first iPhone user experience, some others who are already iPhone users may want to upgrade to the new iPhone 8, therefore dumping the old one. If you are in this category, it is very likely that you would want to erase old iPhone so as to sell it or give it to others. Note that doing this will help maintain your data privacy, so that the new user will not be able to access your private information on the old iPhone. How to Erase Old iPhone? Step 1. First go to Settings, then go to General and tap Reset. Step 2. Then tap “Erase All Contents and Settings” to delete everything. Step 3. At this point, there will be a prompt to enter your passcode, then there will be a warning that all data and media will be deleted. Tap the Erase button as it appears on both occasions. 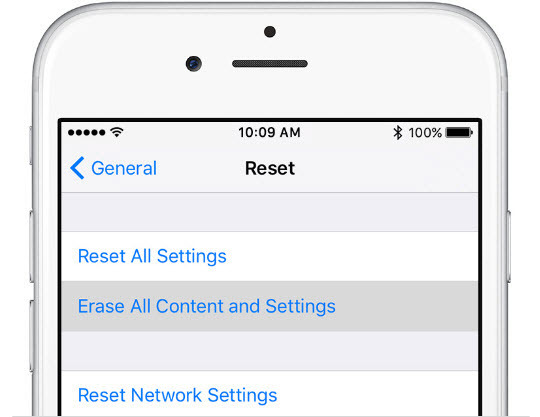 This action will erase your iPhone. Time Wastage: Erasing iPhone data manually can easily waste some of your time when compared to doing it with software. There are always chances that some mistakes will occur along the line which will jeopardize the process. Lack of Security: If security or privacy of your data is desired, then manually erasing data is not desirable. This is because iPhone data erased through this means can be recovered with data recovery tools and as such the security and privacy of your data can be compromised. Due to these disadvantages, iMyFone Umate Pro is recommended in erasing old iPhone. There is no limit to which iMyFone Umate Pro can erase data. In fact, it can erase all kinds of data. It has the capability of erasing both current and previously deleted data. This means that even if you have deleted the data before using this tool, you can see them again and delete them permanently. Umate Pro is capable of scanning your device for these deleted data and erasing them forever. 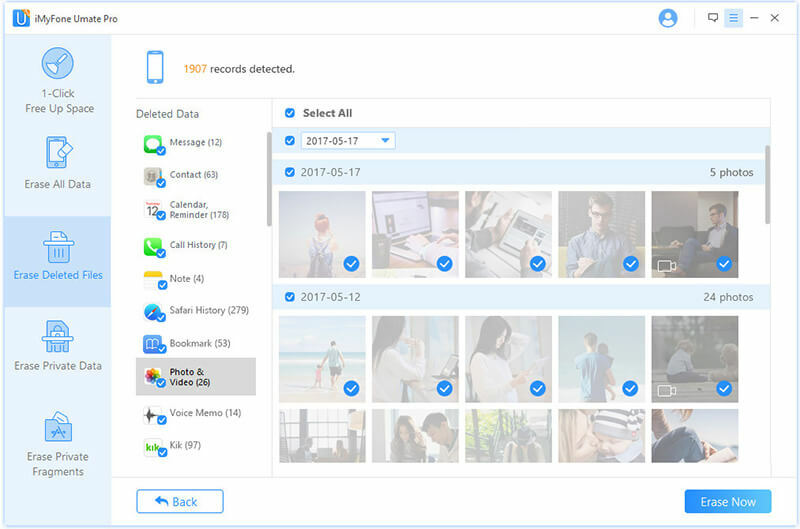 Besides, it can also erase iOS system data and third party app data, visible data, hidden data, junk files, temporary files and in fact, any kind of data, iMyFone Umate Pro is equal to the task. Unlike manual deletion of data, Umate Pro saves you a whole lot of time and it is also secure. This means that any data deleted by this tool remains 100% unrecoverable even with the most sophisticated and modern recovery tools. It can preview files, select and mass delete data however you want it. iMyFone Umate offers you 3 outstanding erase modes to choose from according to your needs. 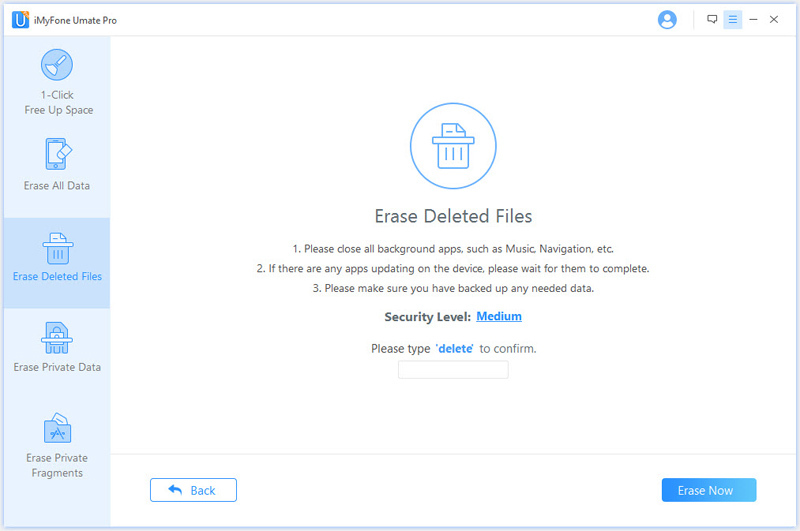 These modes are Erase Deleted Files, Erase All Data and Erase Private data, all of which can erase old iPhone permanently with no trace. All you need to do is to choose the one which matches your requirement and it is done. Note that this tool is easy to use and just takes few steps to clear old iPhone forever without recovery possibility. The following steps are just what you need. Step 1. Connect your old iPhone device. Step 2. Select the erase mode that best suits your requirements. Step 3. Erase old iPhone permanently.